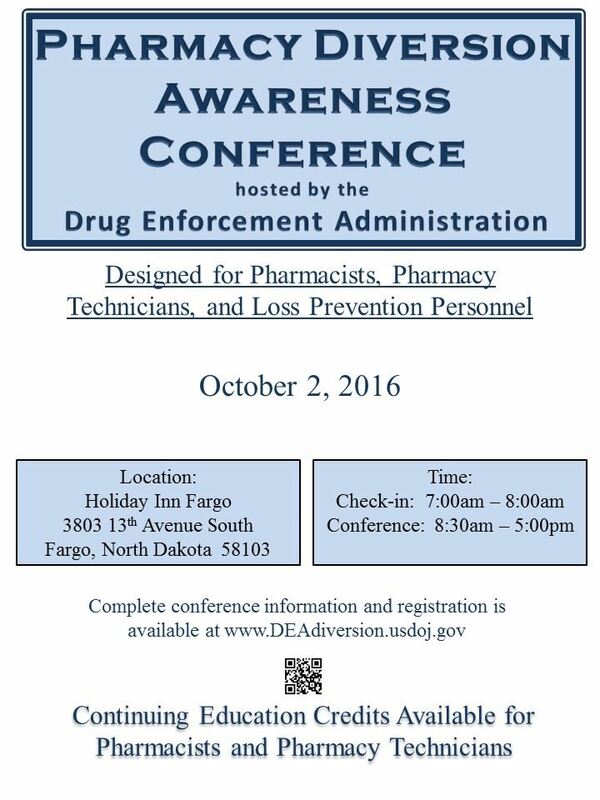 The Drug Enforcement Administration (DEA) is hosting a Pharmacy Diversion Awareness Conference (PDAC) in Fargo, North Dakota on Sunday, October 2, 2016. To date, the DEA has hosted 72 such conferences around the country. The Fargo PDAC will be open to registered pharmacists, pharmacy technicians and pharmacy loss prevention personnel who work for DEA-registered pharmacies in the state of North Dakota. The one-day conference is scheduled for Sunday, October 2, 2016 from 8:30 a.m. to 5:00 p.m. The conference will be located at the Holiday Inn Fargo, 3803 13th Avenue South, Fargo, North Dakota 58103. There is no fee for this conference, and CE credit is tied to this course.